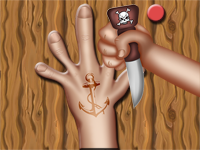 How many virtual fingers will you lose while you play this intense online action game? Grab the dagger and see if you can hit the correct spots without getting injured. If you aren’t quick and careful, blood’s gonna fly! Tell us what you think about Whack No Hand. Leave a review or share a tip.